Pure luck. Being in the right place at the right time. Knowing the right people. Where you were born. Who your family is. Where you grew up. From this, comes opportunity. All of us who volunteer for the TLDP are lucky. We have had the opportunities to thrive in our own communities and we have been given the opportunity to help other communities. We count ourselves blessed. Once at Maubara, the team got the gear prepped for the first week in the subdistrict of Letefoho. They left later than expected on Sunday, as they had to wait for Bony, our translator, who was coming from Maliana, where he had just attended his uncle’s funeral. They also had to execute some unforseen repairs on the old and new Forrest units, with help via phone from guru, Keith Mentiplay, in Australia. But soon they were on their way, with Afonso (One of the Sisters’ drivers who has been on many of our trips before) and Bony, in a borrowed yellow tip-truck, carrying all our less-sensitive gear, and Wayne, Eve and Blanche in T2. The trip took 5 hours; the roads were a quagmire due to unseasonal rain. Week 1 was a mixed bag – there were some inauspicious moments – discovering that they had left the needles back in Maubara, continual problems with the electrical supply, the splitting of the team at night for 2 days due to the unsuitability of their first accommodation option (think rats and fetid bathrooms); but there were also multitudinous incidences of care and kindness, joy and thankfulness. The first 2 days were spent in beautiful Lakau. 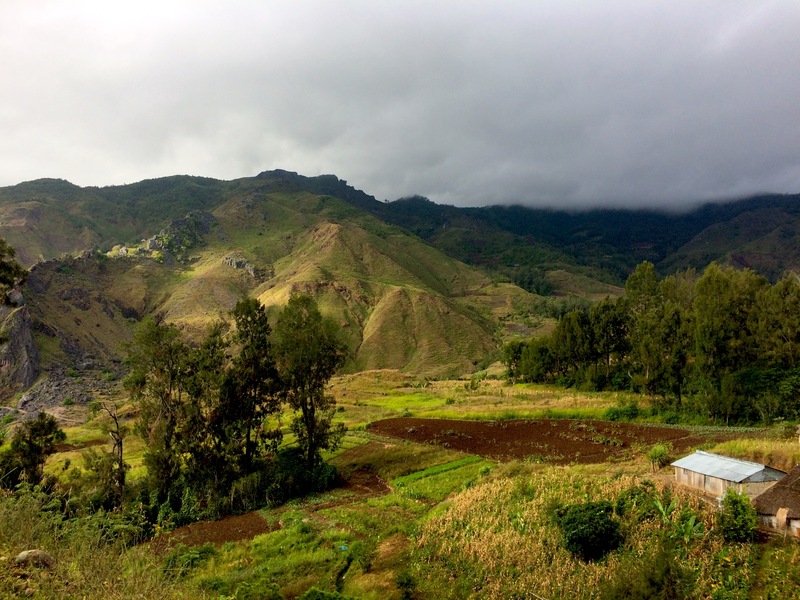 There had been a lot of activity since the team visited this tiny village last year – there is a new Garden of Peace, complete with fishponds and gazebos, a covered community meeting place, and they are in the process of building a grand new church. The villagers were wonderful hosts – Eve’s diet did not get off to a good start. The needle issue arose on Day 1 and was resolved, with amazing rapidity, by Tino bringing them some needles on a borrowed bike, from Gleno (a 4 hour return journey). Tino had just been released from hospital (which is why he wasn’t working with the team)- he is our hero. Bony was also heroic in coordinating the team’s salvation – the negotiation of Lakau’s telecommunication network involved a great deal of climbing atop rickety structures. The first weekend had been earmarked for the workshop that Sr Filomena, Blanche, Tino and Aida had been planning since last July. Also heavily involved was Ligia Ximenes, an attaché to the Timorese Consul General, whom Blanche had met at our big fundraiser in 2014, and who generously gave up her time to do the initial translation of the workshop material – thank you Ligia!!!! Bony had been recruited in April and he had spent a lot of time with Tino and Blanche discussing the workshop. The plan was for all three to meet back at Maubara in the afternoon on Friday to go over the presentation and to set up for the next day, which was to start at 8am. The reality was vastly different. The borrowed overhead projector had no cords with it. Tino and Bony stayed in Dili until 8pm at first looking for a replacement, and then waiting for the cords to be delivered to them. They arrived in Maubara at 9pm, and the team stayed up into the wee hours going over the material. The next day the projector refused to work for 2 hours, but no one showed up until 10.30, so that was ok! The presentation went well – Tino’s delivery was excellent – and all the participants (local doctors, nurses and midwives) found the information enlightening. Success! Tino was especially happy to have been given the opportunity to present the workshop and is keen to do it again. 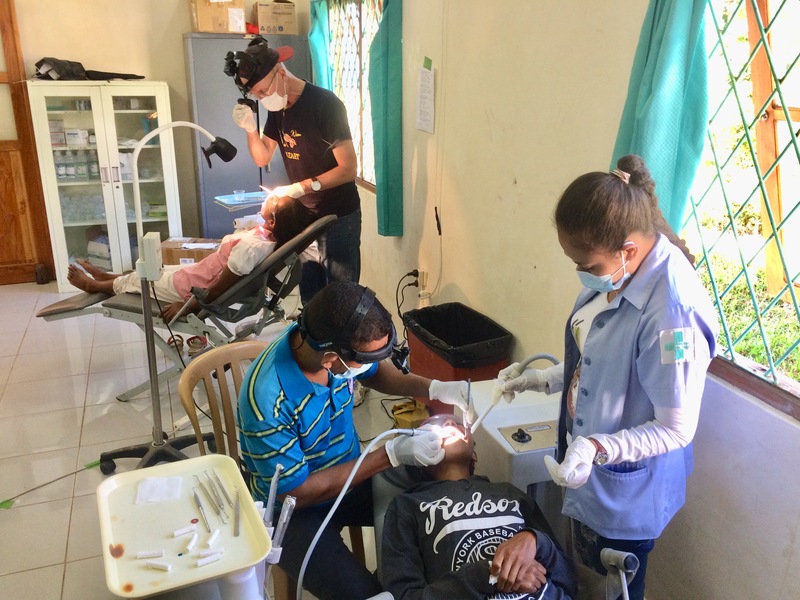 Tino is the TLDP’s longest mentored dental therapist and he has now been given the opportunity to teach students of his own from the University of Timor Leste – he is a measure of our program’s success. Week 2 was spent with 3 days in Maubara Clinic, a day at the community centre in Guiço, and 2 days in Atabae Hospital, where Bony’s brother is a doctor. Three very different locations – a small clinic; an open-air pavilion where the team was helped by the local health post director, Mr Paulino, who made all announcements to the patients via loud speaker; and the foyer of Atabae Hospital’s newly built administration building. In all three locations, electricity was sporadic. Team 3 will converge on Brisbane Airport early tomorrow morning as they start the journey to TL. 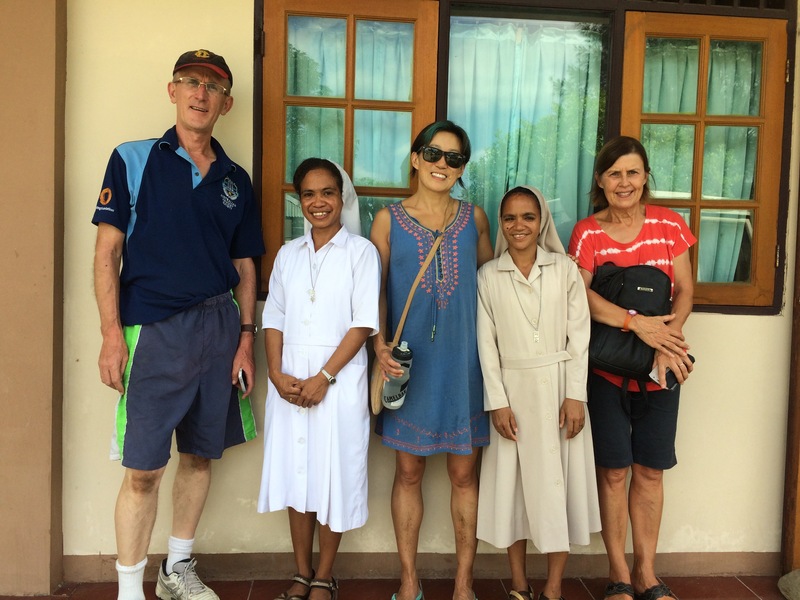 Consisting of Blanche Tsetong, Wayne Pearson and super-excited newbie, Eve Shepard, the team will be in Tl for 3 weeks in the Letefoho, Maubara subdistricts and the beautiful island of Atauro. The team has finally taken delivery of our brand new Forrest Dental Cart which is intended to replace our ageing and increasingly unreliable ADEC unit. WE are very excited! 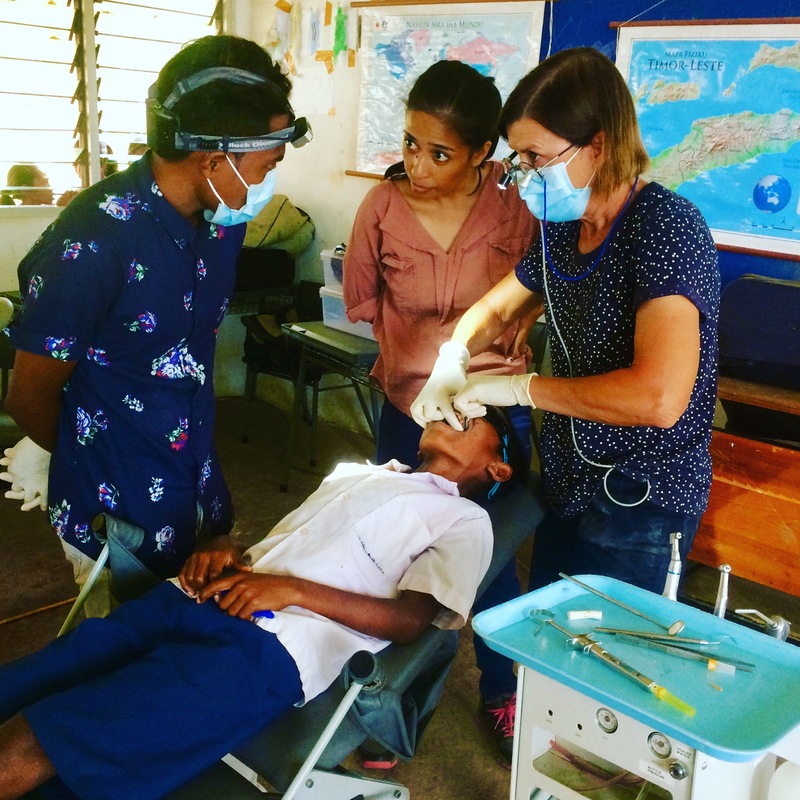 They will also be taking over much needed donations of dental materials from Henry Schein Halas, Queensland and Northern Territory Health and from Fitzroy St Dental Practice in Grafton. THANKYOU to all our fabulous supporters. The WA (Western Australia) contingent which comprises TLDP’s second team for 2016 sets off this Saturday. This team consists of team leader, Dr John Moran, his trusty sidekick, Dr John Whyte, and newcomer, Bella Miller. 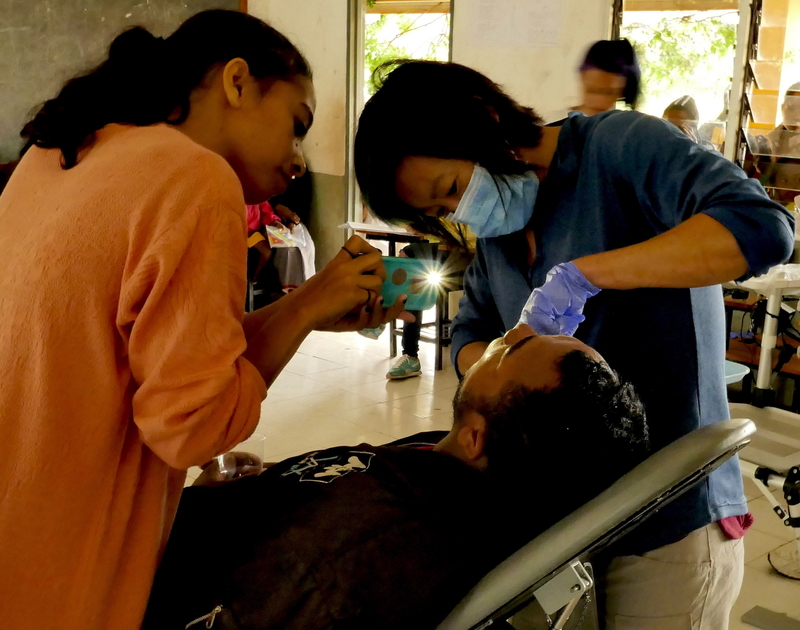 Flying to Dili via Bali, they arrive Sunday afternoon, ready to tackle the onslaught of patients in Railaco, where they will be spending the majority of their time this trip. But never fear, there will be no dull boys and girls on their return home – the hospitality of Father Bong and his crew in Railaco is second-to-none – there will be lots of fun to be had! Hopefully, the team will also get to work with Tino, who is currently in Gleno. Fingers crossed! Good luck Team 2! Safe travels!